The African Grey is one of the most popular of the larger parrots in the pet trade. It is renowned for its ability to speak and it’s intelligence levels which are often compared to that of a 5-year-old child. Unfortunately, this has led to excessive trapping of the birds and the collapse of their natural populations. 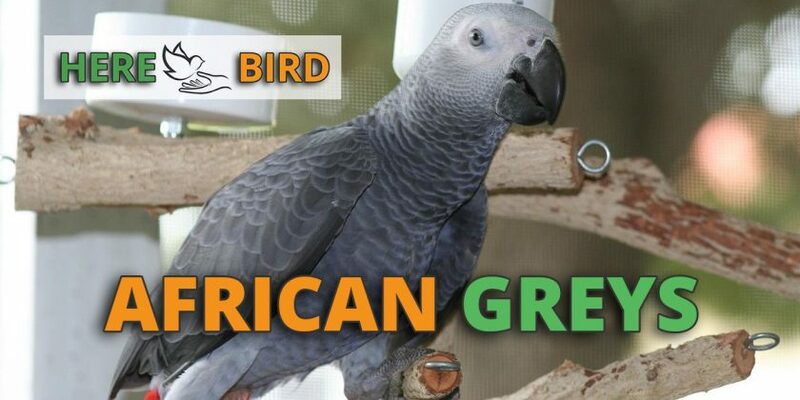 According to the World Wildlife Fund, international trade of this endangered bird has been totally banned, though hand raised African Greys from breeders are still available. The bird referred to as an African Grey is actually two different related species of parrots. The Congo African Grey (CAG) is a companion parrot whose scientific name is Psittacus erithacus. They are moderately large parrots, with the Congo variety measuring 12.8 inches (33 cm) and weighing about 14 ounces (400 g). 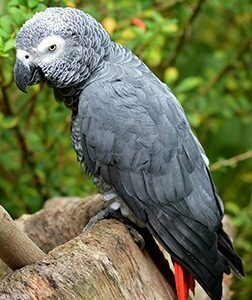 The Timneh African Grey (TAG) is also a companion parrot that is slightly smaller at 10 inches (25.4 cm) and about 11.2 ounces (320 g). Its scientific name is Psittacus timneh. Their population was formerly spread over much of Africa but now is severely threatened by deforestation and heavy trapping for the pet trade. They prefer primary and secondary rainforests as their natural habitat and feed at the tops of trees. Large communal flocks are formed when roosting and break into smaller groups for feeding. These parrots are primarily grey with red tail feathers. Birds that are older than 18 months can be reliably sexed by examining the underside of their tails. Males possess a solid red tail while females’ tails are silver tipped. African Grey Parrots are sturdy looking parrots with fairly short tails. What at first appears to be a dull grey plumage on closer inspection is detailed with a subtle scalloping of its feathers. In the wild, this bird displays a variety of screams, shrieks, and whistles as well as mimicking other birds and mammals. Both TAGs and CAGs can talk, though the Timnehs mature sooner and can start talking at around six months of age. Timnehs also do not mimic the precise sound of a human voice as well as a Congo Grey. That being said, they both can develop extensive vocabularies and have the capacity to understand what many words actually mean and use them appropriately. Below is a video of an African Grey showing off its vocal talents. What is it Like to Live with an African Grey Parrot? Some owners feel that living with an African Grey is like living with a four-year-old for fifty years. They are extremely emotionally needy and require regular and extended interaction with their human companion to avoid developing severe behavioral problems. They are certainly not a bird to be obtained on a whim and will do best under the care of an experienced bird owner. African Grey Parrots have heavy bodies and can be injured if they are allowed to fall, which they are prone to do, according to petcha.com. This is especially true of young birds and to minimize the risk of injury, perches should be placed low in the cage. They are moderately energetic and require a high level of mental stimulation that can be partially accomplished through a variety of toys. Most African Grey Parrots that are the first bird in the home develop a “single-species” flock mentality, with the parrot thinking of your family as the other members of the flock. While they may acclimate to another Grey, they are generally not good birds to keep in mixed avian company. They will bond with all family members and should not be considered as a “one person bird”. Though your parrot will demand a lot of personal attention from you, they are not particularly cuddly birds. Parrots that do not receive enough attention and mental stimulation can develop behavioral issues such as screaming and feather plucking. In some cases, it can be challenging even for an experienced birder to keep an African Grey satisfied. These birds can be nervous and stressed easily, so may not be the best choice if small children are likely to be involved in their care. Timnehs are generally calmer and more tolerant of changing conditions in the home. They can be trained to perform many feats. Below is a video demonstrating the range of behaviors that an African Grey can be trained to execute. 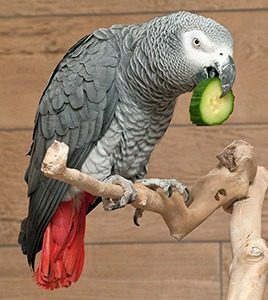 How Should I Care For an African Grey? 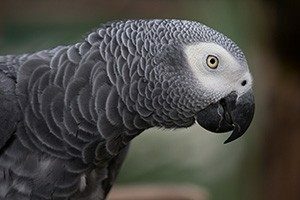 African Greys do well at room temperature and their cage should be located away from drafts. At a minimum, the cage should be 48Hx36Wx24D inches (122Hx91Wx61D cm) with bar spacing of 3/4 to 1 inch (1.9 to 2.5 cm). According to african-grey-parrot.com, there should be horizontal sidebars to allow the birds to climb easily. As mentioned previously, perches should be placed low in the cage, especially for younger birds who may not be as steady when climbing. You will need to keep your parrot’s nails trimmed. These parrots have their first molt at about 8 months of age, and then at around 11 months will have the first serious molt which will be a yearly occurrence. Your parrot needs to get wet to keep its feathers in good shape. You may have to experiment to find the best way as some birds prefer to be sprayed or misted while others like to bathe in a shallow water bowl. Diet should consist of high-quality pellets and lots of fresh fruits and vegetables, especially those with high levels of calcium and Vitamin A. The birds can be bred year-round and have a clutch of from 1 to 3 eggs. How Healthy Are African Grey Parrots? In captivity African Greys have a lifespan of 40 to 60 years. They are generally healthy but do suffer from age-related conditions such as arthritis and diabetes. Proper diet can help alleviate these issues to a degree. They are prone to feather plucking and excessive screaming if neglected, so ensure that your bird gets plenty of loving attention. African Greys can cost anywhere from about $1500 to over $3500, with the differences based on age and individual breeder. Younger birds are more expensive. Long-term costs over the lifetime of the bird can be substantial, as it needs plenty of fresh food and a steady influx of new toys to keep it mentally stimulated. See our gull guide to the costs of an African Grey available here. Should I Get an African Grey? Adding an African Grey to your family is a big commitment and one that should not be taken lightly. If you can provide the parrot with all the attention that it needs it can be a rewarding relationship in both directions. If not, neither you or your bird will be happy with the living arrangement.